Integrate your Blog with your Community. 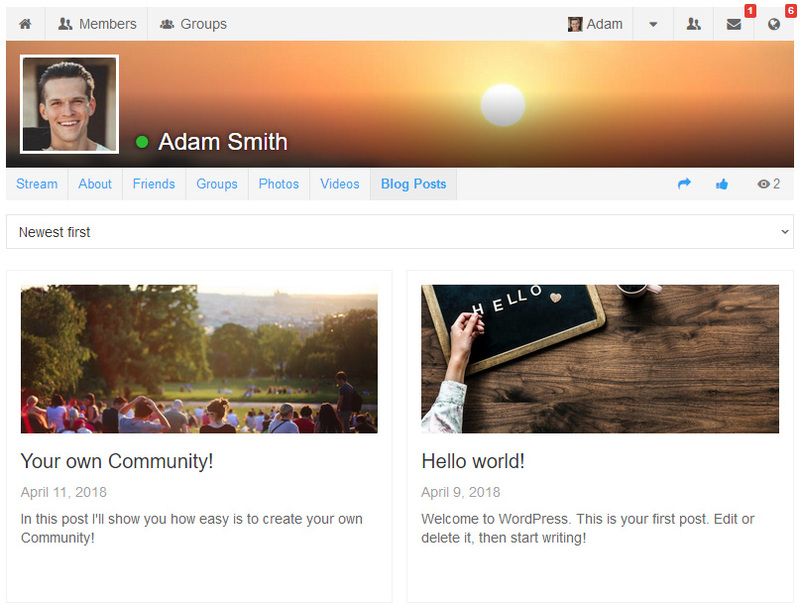 Add Blog Posts tab to user profiles, featuring blog entries created by your community members. Automatically create a new PeepSo activity stream post. This plugin adds a configurable Blog Posts tab to user profiles, featuring blog entries created by your community members. it is also capable of creating a PeepSo activity stream item each time a new WordPress post is published. This includes regular blog. CPTs (custom post types) are not supported. All post types are separately configurable with a customizable “action text” and can be enabled/disabled. An activity stream item is created only once, no matter how many times you re-publish the related item. This plugin does not include the ability to create blog posts on the frontend. However, it does include an integration with a 3rd party plugin which does allow doing it right from user profiles. BlogPosts plugin works with any 3rd party plugin allowing frontend blog posts creation / submission but for the time being just one is integrated into user profiles. Display users’ blogposts in their profiles. Automatically create a corresponding Status Post on Community Stream updates when a new blogpost is published. Choose between a single and double column layout in user profiles. Configure blogposts’ featured image displayed in user profiles. Integration with User Submitted Posts allows users to write blogposts right in their profiles.